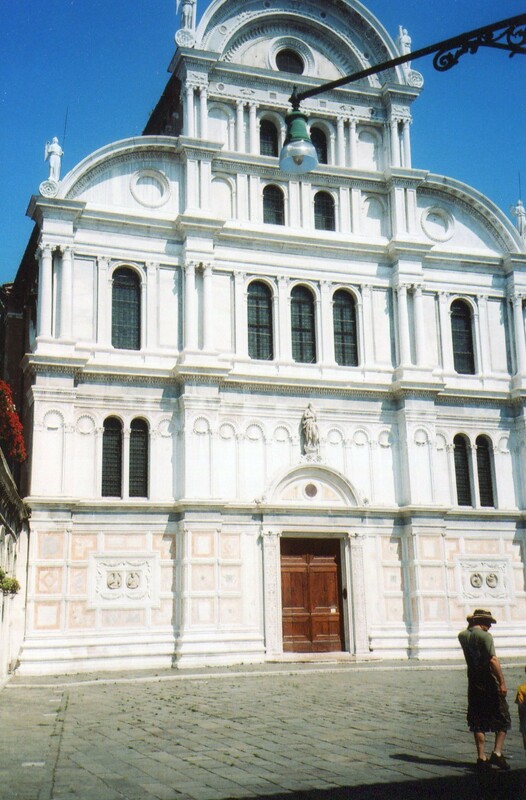 Venetians had many reasons to celebrate as they entered the Renaissance. In 1380 they won a final victory over Genoa–their long-time rival for sea trade. In 1405 they took control of the great medieval city of Padua–the first stage of their growing land-based empire. They developed a huge merchant fleet, and it put it to good use. 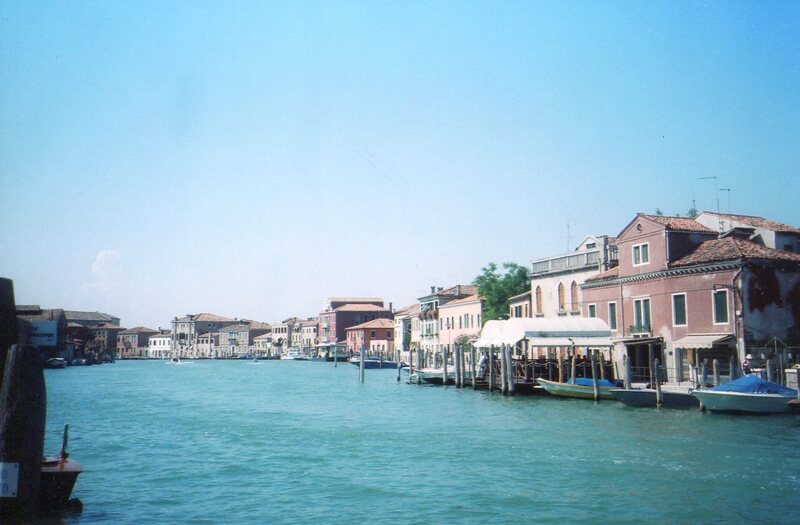 Venice was one of Europe’s manufacturing centers, and its ships carried its products through the west and the east. Venice especially valued its glass making, which was centered on the smaller island of Murano (above). Venetians were proud of becoming one of Europe’s main economic forces, and they were about to project their identities by creating art that made their city one of the West’s main cultural forces. Venice had a strong Gothic heritage. It had traded a lot with northern Europe, where Gothic style reigned, and many of its churches and upper-class homes were in that style. The middle house in the above photo is a good example. The fancy line of windows on the middle floor displayed the main hall. But major changes were coming. 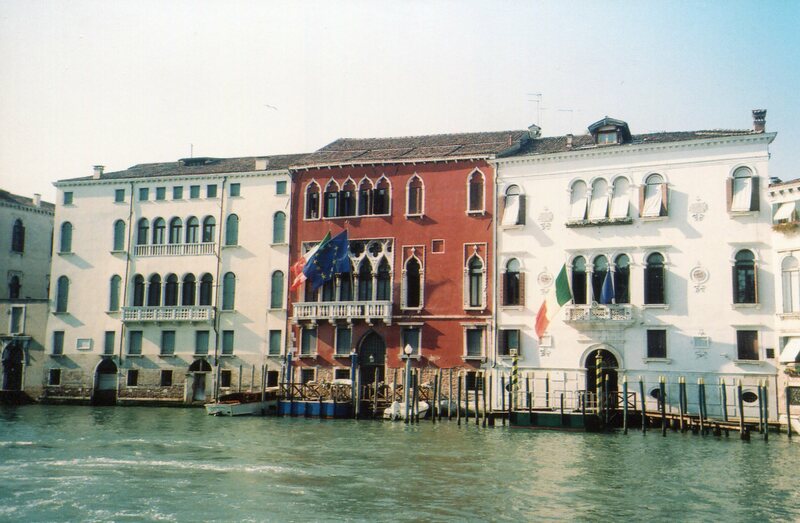 Venice enjoyed a building boom in the late 15th century which synthesized new ideas. 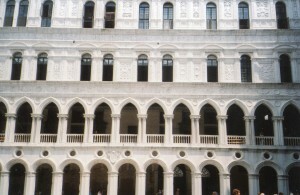 The inner yard of the Doge’s palace (above) blends Gothic arches with semi-circular arches that Florence and Rome favored. Bernardo Bembo was an ambassador to Florence and a close friend of Lorenzo de’Medici. Lorenzo was Florence’s most powerful resident, and a big fan of Plato. Bembo returned to Venice with ideas about the divinity of geometric ratios, and their ability to foster good political rule. 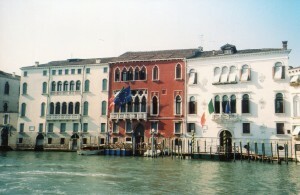 Another prominent Venetian Platonist, Girolamo Dona, was also involved in his city’s architecture. At the same time, one of the most learned Venetians (though born in Verona), Fra Giocondo, was studying Rome’s ancient ruins. So lots of people’s ideas were bringing the West’s traditions of emphasizing abstract lines and shapes into Venice when its wealthy citizens were commissioning art to display themselves. And they were using the same ideas to harmonize themselves with God. The late 15th century was a great age of church-building in Venice–its leading citizens were hoping that their good fortune would continue. They expressed these hopes with beautiful arrangements of abstract lines and arches. San Zaccaria (above) is one of the finest examples. It’s a very short walk from there to the Doge’s palace. Buildings for God and government reinforced the sense that abstract forms are the source of well-being. San Zaccaria does this very well. Its bottom 2 floors look more massive. But as on Pisa’s cathedral, the arrangements of arches on the upper floors are more elegant, as though they’re becoming more spiritual as they ascend. But then a massive arch tops the whole facade as though to say that God’s order over the whole universe is firm, and geometrical. Venice was learning lessons from Florence well. 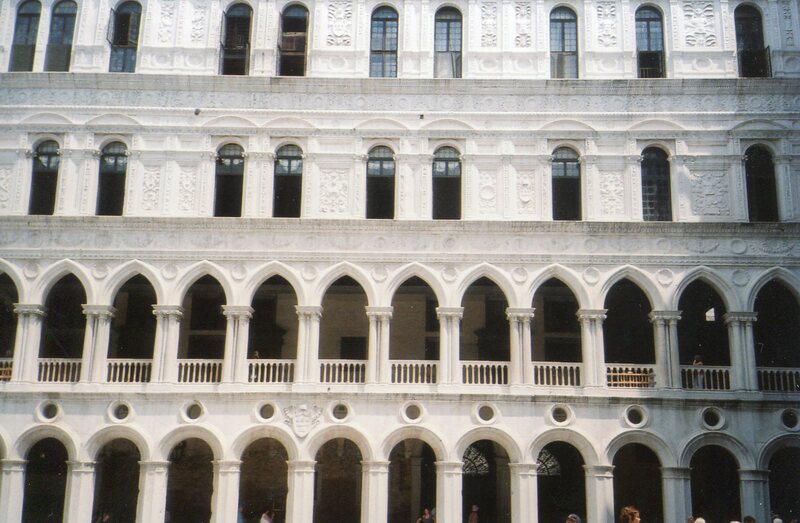 But there are many more dimensions in Venice’s use of these forms. In the next poston Venice’s canals, we’ll see that Venice didn’t imitate Florence and Rome–it was so creative that it became one of the main spearheads of Western culture. We’ll also see some of the deeper motivations behind these forms–they masked anxieties of living in a turbulent time. If you’re ready to venture into the larger world as the Venetians did, you can explore another great culture that thrived along canals, the Khmers. They integrated their world with a very different mixture of ideas.